Google Analytics Shortcuts to Help You Save Time! 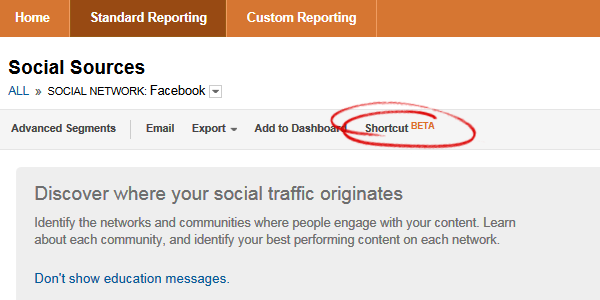 Save Valuable Time in Google Analytics with Shortcuts! The Google Analytics blog has announced the arrival of “Shortcuts”, a new feature on the tracking platform that will make the task of chasing metrics faster – particularly for those of you who like to access your information daily! Rather than having to go through the “find report, add segment, change, sort” process daily, with Shortcuts you can do it once, save it, and come back to it in a single click. Creating a Shortcut is Easy! Whenever you are checking your most important metrics via Standard Reporting, simply scroll up to the top of the page and click on “Shortcut”. Once clicked, you will be prompted to name your Shortcut. We recommend renaming the default to be more specific. MY HOT TIP: As you can see, the default here is “Social Sources”. PAH! The point of shortcuts is to save you time, and if you have several social sources you check often, this default isn’t going to make things easier. 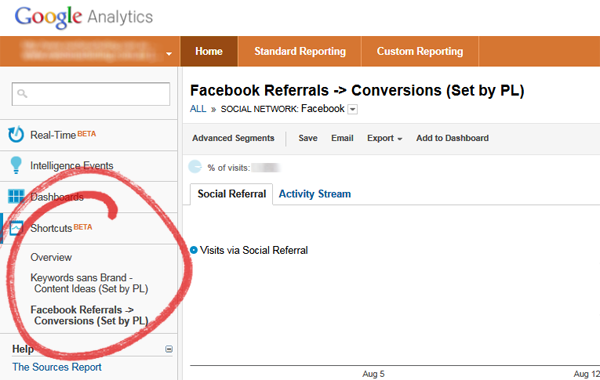 In this case, I am wanting to create a shortcut for Facebook Referrals that create conversions. If your account is managed by multiple people, it’s also a good idea to make a note of who has set the Shortcut for accountability purposes, and ensure your shortcut isn’t edited or deleted by other users. Also keep note that shortcut names have a maximum character limit of 50 characters. Once saved, Google Analytics will take you to the Home section, and show you your saved shortcut – where it can be accessed from now on as soon as you sign in. Any changes made to the information you view while in Shortcut mode can be saved to update the Shortcut, and just like reports, they can be e-mailed to you as well. How’s that for productivity? If the latest changes excite you, make sure you subscribe to our Analytics blog posts to make tracking your online business easier and more effective. Nice one Paula – good to see Analytics getting some love from the Big G much like Web Master Tools has over time. Shortcuts look highly valuable to me in streamlining the reporting process.